A study by the Conference Board of Canada found that small (and medium) sized enterprises owned by recent immigrants to Canada, are more likely to export, and they are also among the fastest-growing SMEs. This series highlights some of their stories. Syed Ali was so committed to launching a food distribution company in Canada, he sold his home to raise the money he needed to do so. He moved to Canada from Dubai in 2007 with his family because his wife is Canadian and they wanted to settle here. At the time, he was running a company that sold construction equipment to Iraq and he continued to do that for a few years before he saw an opportunity in the Canadian agri-food industry, and he wanted to seize it. He exported pulses first, but realized the margins were too slim, so he started looking at beef instead. “We executed our first beef contract and I haven’t looked back since,” he said. Although the family can now afford to buy a house, he’s waiting until the market softens. The good news, however, is that his Markham-based company is doing well. He formally launched in 2012 by exporting Canadian beef to the Middle East and still today, beef represents the largest share of its exports, with the Middle East being the destination for most of his products. He works with distributors in Saudi Arabia and UAE. Shortly after Ali solidified the beef market, he started exploring other products. At first, securing Canadian suppliers and foreign buyers was a challenge, but eventually, he did what he set out to do: build a reputation in the industry that would eventually see suppliers and buyers coming to him. He credits the support he received from Export Development Canada (EDC) and the Canadian Trade Commissioner Service for much of his success. To a lesser extent, the company ships its beef to Europe and China, in addition to its mainstays in the Middle East. 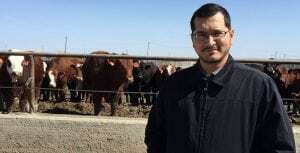 “We procure cattle from Alberta, process and box them under our own brand, and then ship them to the EU and China,” Ali said. Ali was born and raised in India, but for the seasoned exporter, India is a market he’s only recently started exploring. “We are taking part in India’s largest trade show this year – AAHAR in March 2017, which will give me a chance to look into that market,” he said. Many immigrants who start exporting businesses in Canada do export back to their home countries because they know the business landscape and the culture. But, this was not an option for Ali early on due to the fact that beef is not commonly exported to India. Now that he has a basketful of other products, he has started considering it. “A couple of my contacts from UAE are in India, so I’m going to leverage those connections,” he said.